A visit to Leela Thai allows you to experience a taste of Thailand through authentic Thai recipes passed down through the generations. Balancing the bold flavours of Thai chilies, curry pastes and special freshly made sauces with the lighter ingredients of coconut milk, fresh vegetables and herbs, owner Taen Thorpe and her staff offer a marvelous array of dishes, from Pra Ram Lohng Sohng (sliced chicken breast on a bed of spinach topped with peanut sauce), to mouth-watering Curries, to Sweet Rice and Fresh Mangoes. 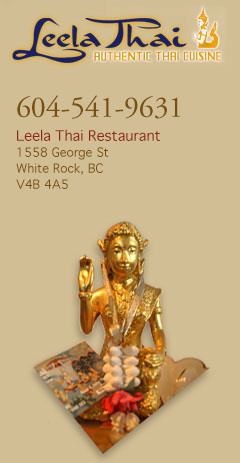 Taen has worked at Leela Thai for nine years. 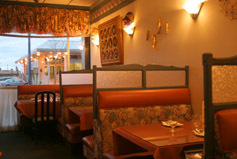 In 2004, Taen and her husband John became the proud owners of the restaurant. Taen works with her four talented Thai chefs to implement a distinct style of Thai cuisine using the most authentic recipes to create tasty and appealing dishes. Taen has made sure the Leela Thai menu is about choice, flavours, quality and presentation - a true taste of Thailand. It's all aroy (delicious).